Posted September 5th, 2017 by Kelsi Hines & filed under Uncategorized. 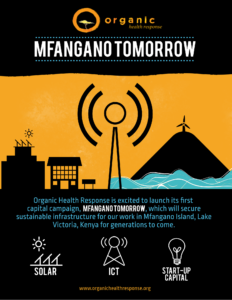 Organic Health Response is proud to launch the “Mfangano Tomorrow” Campaign, which will secure capital to support sustainable infrastructure and operations in Mfangano Island, Lake Victoria, Kenya for generations to come. Since opening the doors of the Ekialo Kiona ‘EK’ Center in 2010, Organic Health Response (OHR) has grown to support over 5,000 EK Club members; membership is based on HIV/AIDS voluntary counseling and testing (VCT), which actively combats the social stigma of the disease. OHR supplies the only high-speed broadband Internet connection to the 30,000 residents of Mfangano across the longest wi-fi link in East Africa. EK FM Radio East Africa’s first wind-powered radio station, and one of the only stations in the region to broadcast in Suba, one of UNESCO’s critically endangered languages. Operated by local youth, over 200,000 listeners throughout Lake Victoria enjoy quality public health, environmental and cultural programming. Sustainable energy sits at the core of OHR’s mission: OHR has always maintained full energy independence through its solar and wind power systems. The EK Center serves as a model for other rural communities in sub-Saharan Africa that hope to integrate sustainable information communication technology (ICT) and energy into their way of life. However, OHR’s outdated solar and wind systems are almost a decade old: a major upgrade and expansion of our facilities is needed to support valued community programs and services. Our newly designed solar and ICT systems provide access and opportunities to a new generation of innovators in Kenya who can build a sustainable future for their community. If we meet our goals, we can safely reinforce and retrofit our building and tower, as well as power our computer and radio networks without technical interruptions that impede our work. The EK Center is fully reliant on funding from institutional and individual donors. We aim to raise capital to implement a business and income-generating strategy to allow EK to self-sustain core operations and salaries in 2019. For more information, please contact Kelsi Hines at khines[at]organichealthresponse.org.